Our Balloon Adventure! | I am JuJu! In honor of the Albuquerque International Balloon Fiesta that all my friends back home are enjoying this week, I decided to share a fun little story here on the blog. I never realized how much I would miss seeing hot air balloons on a daily basis when we moved to Arizona. 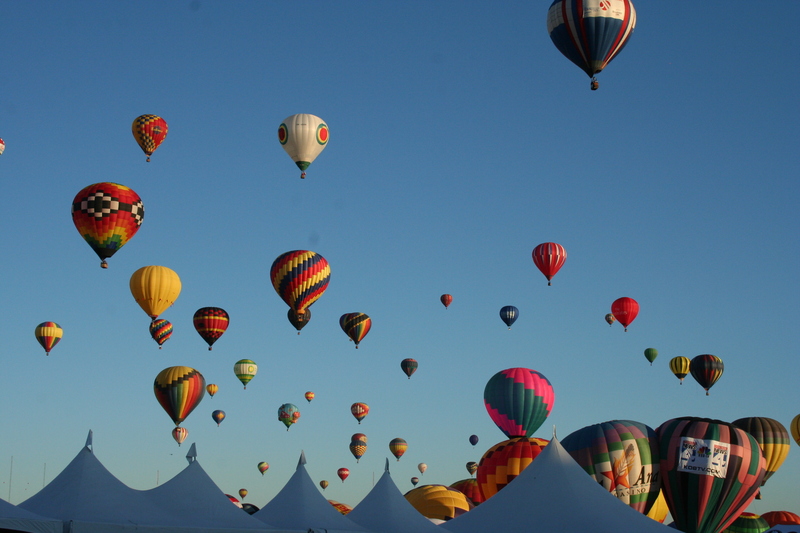 Albuquerque is a Mecca for people who love to balloon. Due to the unique wind conditions, balloons are able to take advantage of what is known as “the box” which allows balloons to essentially take off and land in the same place. Hundreds of thousands of people descend on Albuquerque during the balloon fiesta each year. My parents have had a booth selling my mom’s jewelry for the last 5 years. They donate all their profits to help Skylar. This year’s profits are being used for her hyperbaric oxygen treatment. We are so thankful for their continued generosity in helping our family! During the balloon fiesta there are hundreds of balloons up in the sky each morning. It is absolutely beautiful. The picture above is from the fiesta last year. Even when fiesta isn’t happening there are balloons in the sky all the time. They were constantly landing around our community. One Saturday morning we were all still in our pj’s when we heard a loud whooshing noise. We knew that sound! It was a balloon’s propane tank. Skylar was at the kitchen table and quickly ran out on our back porch. I heard her say “Hey! I really like your balloon” and I heard a voice reply back “Thanks a lot!” I was surprised at how close he sounded. He hadn’t yelled. He sounded as if he were literally in our back yard. We went out to the front of the house just in time to see him land in the street not even 300 feet from our house. The balloon belonged to a company that gives paid rides to locals and tourists. 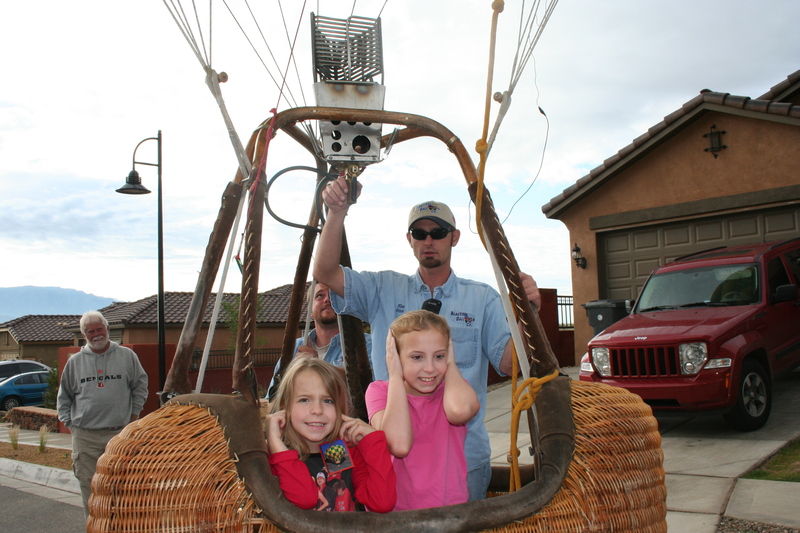 Once the couple who had been on the flight got out of the basket, the pilot let the girls get in the basket so we could take some pictures. The pilot was really great in warning the girls that he needed to give the balloon a bit more “fire” (as the girls called it) in order to keep it inflated. As you can tell in the picture, this is a really LOUD process and the girls pretty much kept their ears covered until they were out of the basket. They both have tremendous sensitivity to sound. 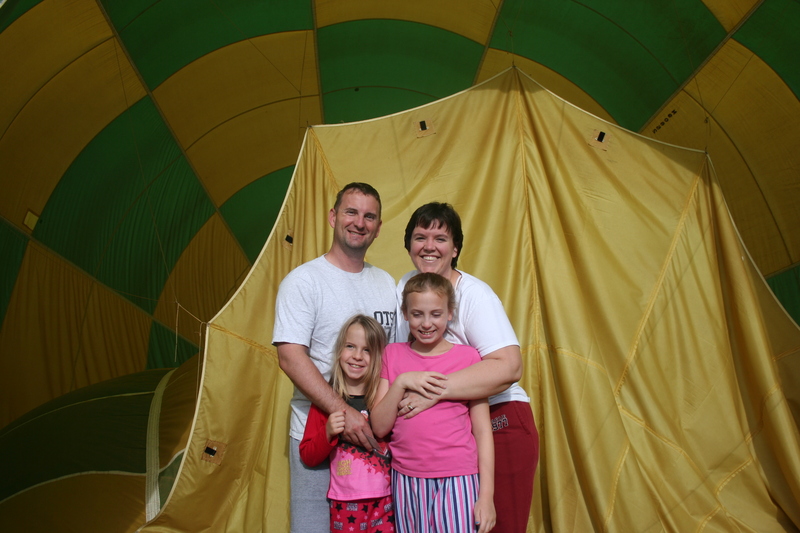 A bunch of our neighbors had also come out to see the balloon and take pictures. 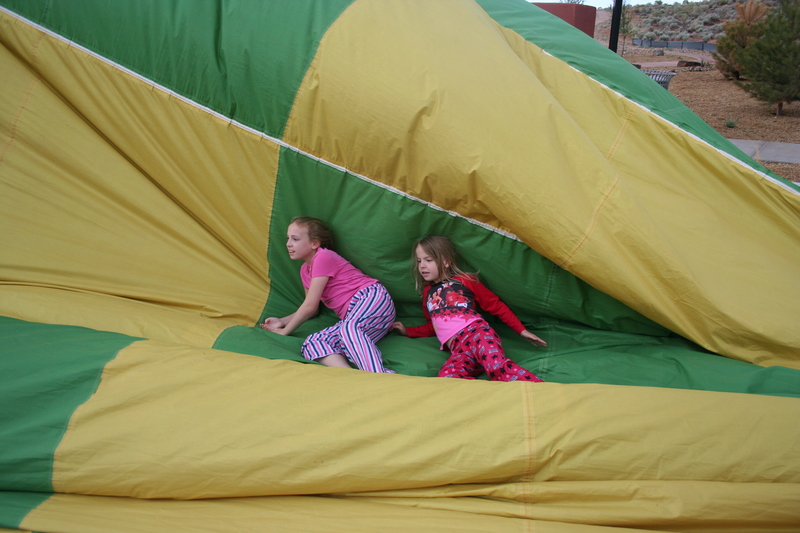 When it was time to deflate the balloon and put it away, the pilot let all the kids help with rolling out the air. They literally laid down and rolled from the top to the bottom to help get all the air out. 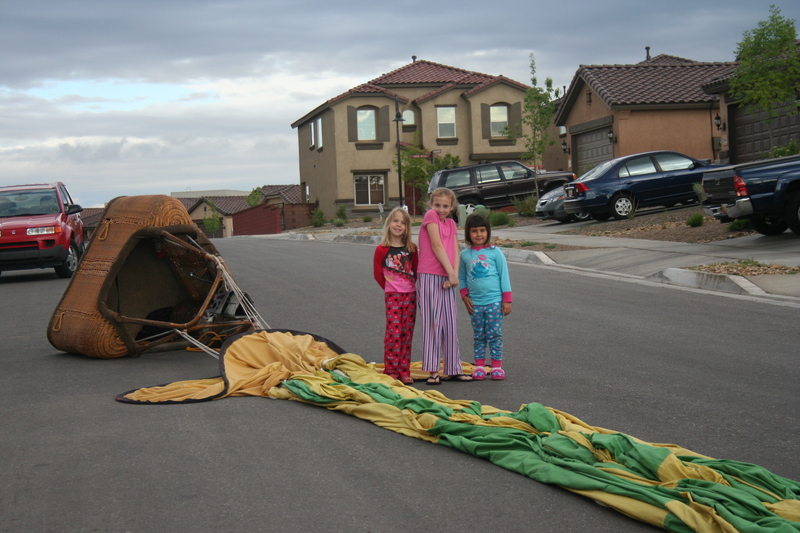 The pilot did a great job explaining why they roll on the balloon instead of stepping on the balloon. Stomping all the air out can actually create holes in the fabric. Balloons are very expensive and this helps keep them in good condition. It was really fun to listen to him explain the entire process and to watch how excited the girls were to help. Chris even got to help put the balloon away in it’s pouch and sit on it along with a few of our other neighbors to push the air out. The pilot was so nice to allow us to take as many pictures as we wanted. We were just bummed that we look so rugged in all the pictures as we had just woke up. I promise you that there has been no photoshopping of these photos. To give you an idea how close it was, in the picture below the 2-story house directly behind the girls is our house. 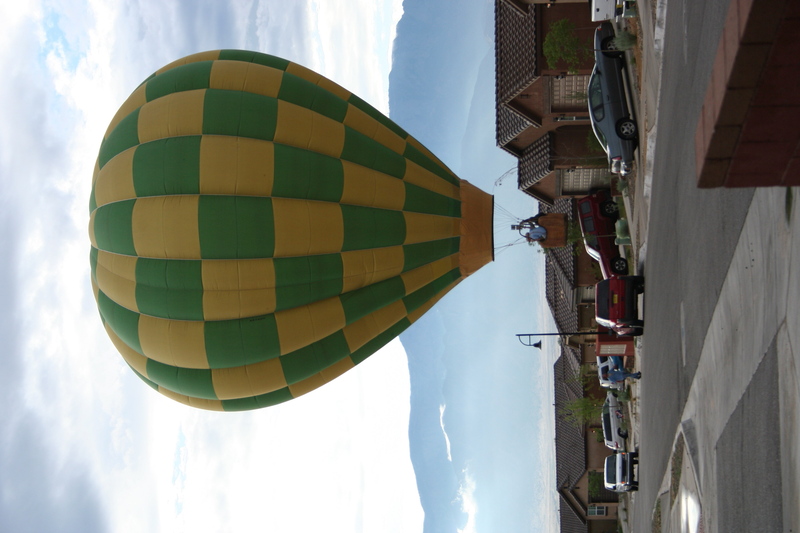 We lived in the Albuquerque area for 4 years and never got tired of seeing all the balloons. I’m excited to be able to catch the last day of the fiesta this weekend as I’m taking the girls to New Mexico to see my folks for a few days during their fall break from school. I can’t wait to see all the awesome balloons in the Albuquerque sky. If you ever have the opportunity to travel to Albuquerque in early October to see the Balloon Fiesta, I highly recommend it. It is well worth the trip! How cool! What an experience for the girls to have. We feel the same way about seeing the sea turtles here in Hawaii. There is a spot that they like to hang out at that we call Turtle Beach. That is not the real name of the beach, but everyone calls it that because there are always turtles sleeping on the sand, eating the moss on the rocks, or swimming in the surf there. We always take visitors there and we always stay for hours watching them! It never gets old!